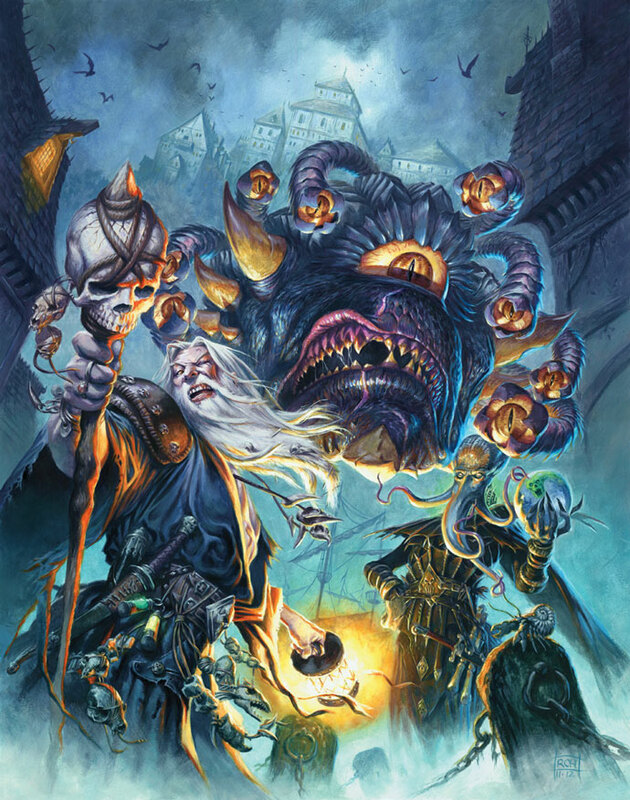 Power is everything in Baldur's Gate, and those who thirst for it will stop at nothing to get it. 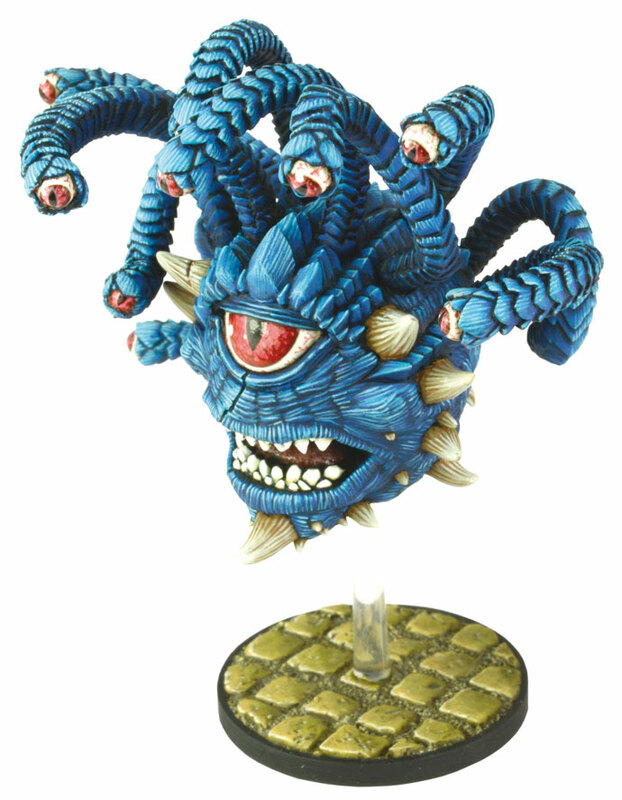 Bhaal, lord of Murder, has set his eye upon the city. 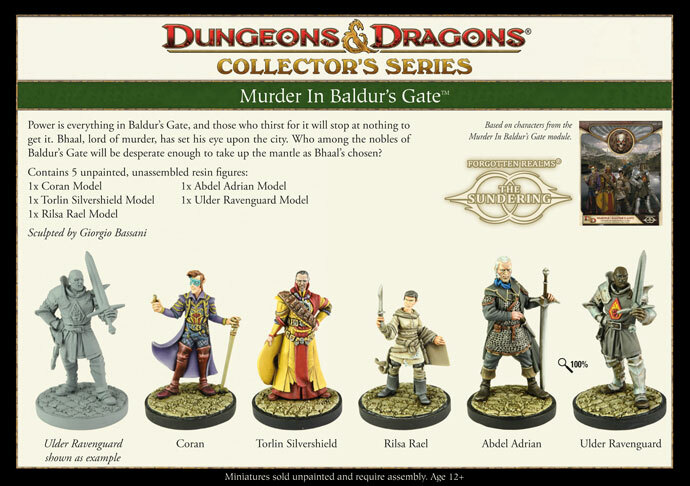 Who among the nobles of Baldur's Gate will be desperate enough to take up the mantle as Bhaal's chosen? 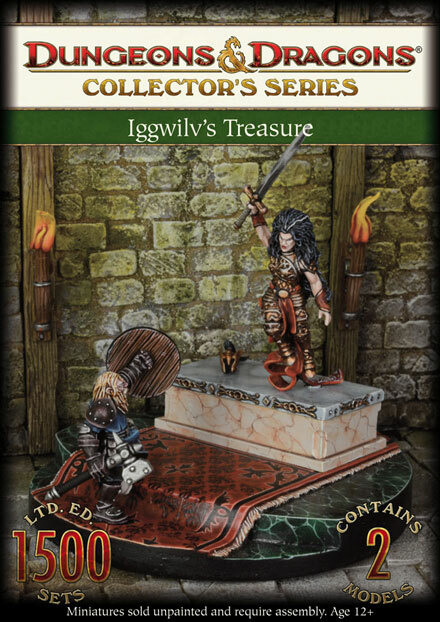 Those brave enough to venture to the central chamber of the Lost Caverns of Tsojcanth find that the wizard Iggwilv’s greatest treasure is not a magic item or a hoard of gold, but her fiendish daughter the vampire Drelzna. 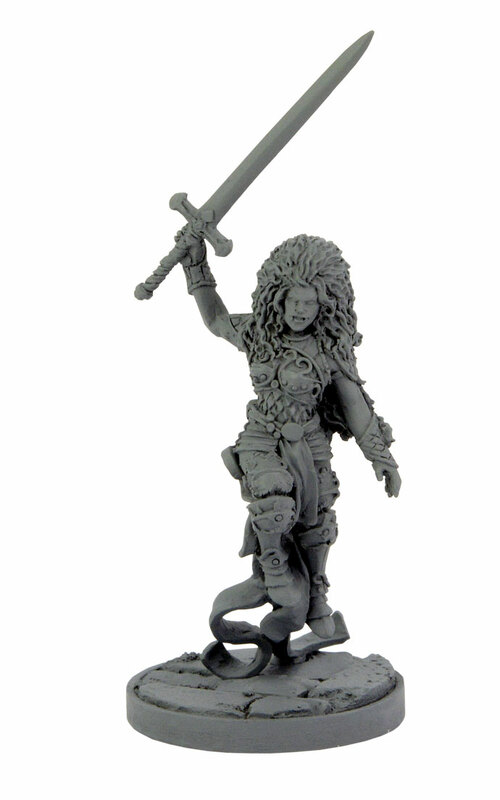 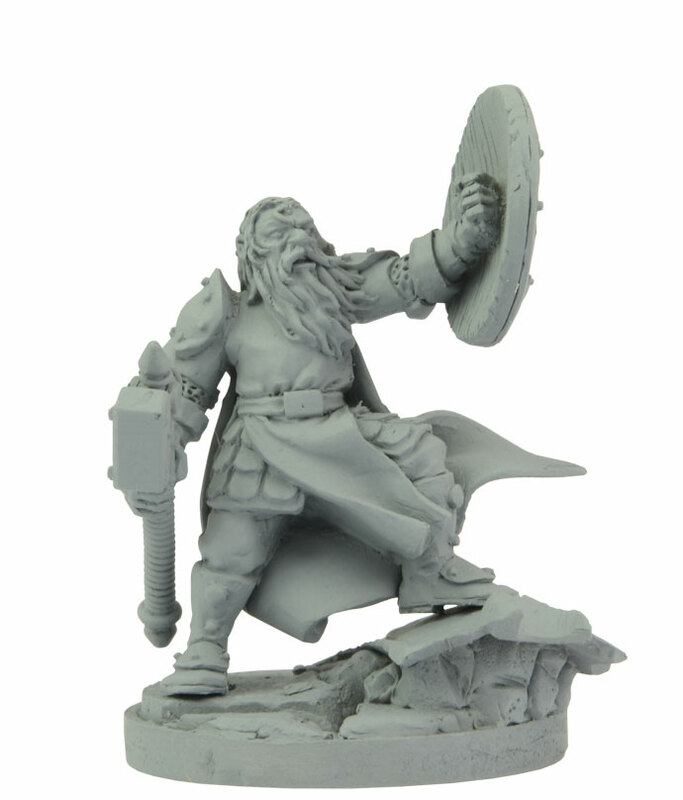 Armed with a deadly magic blade, she has turned triumph to bitter defeat for many adventurers, such as the hapless dwarf Flemin. 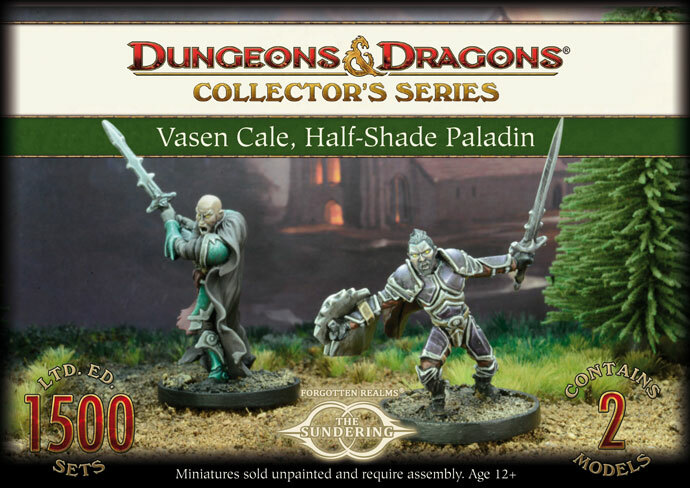 Paladin Vasen Cale is doomed to straddle the worlds of light and shadow. 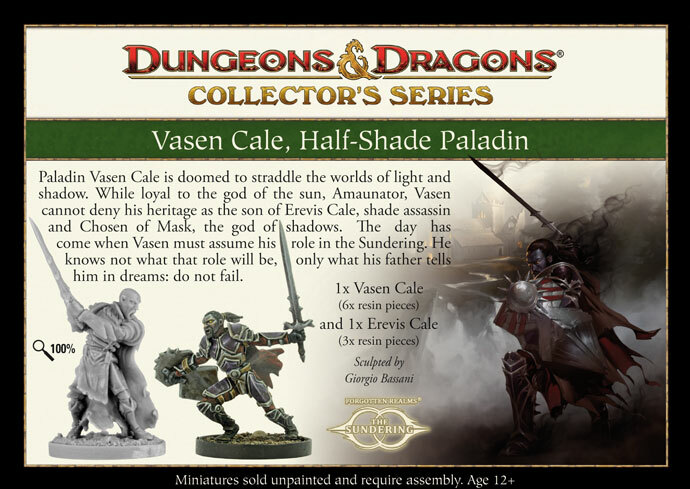 While Loyal to the god of the sun, Amaunator, Vasen cannot deny his heritage as the son of Erevis Cale, shade assassin and Chosen of Mask, the god of shadows. 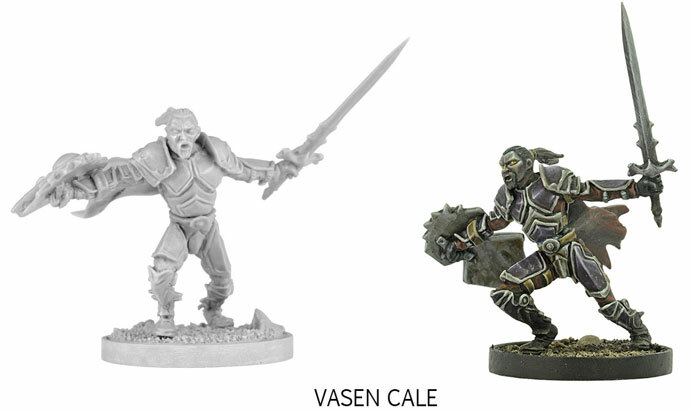 The day has come when Vasen must assume his role in the Sundering. 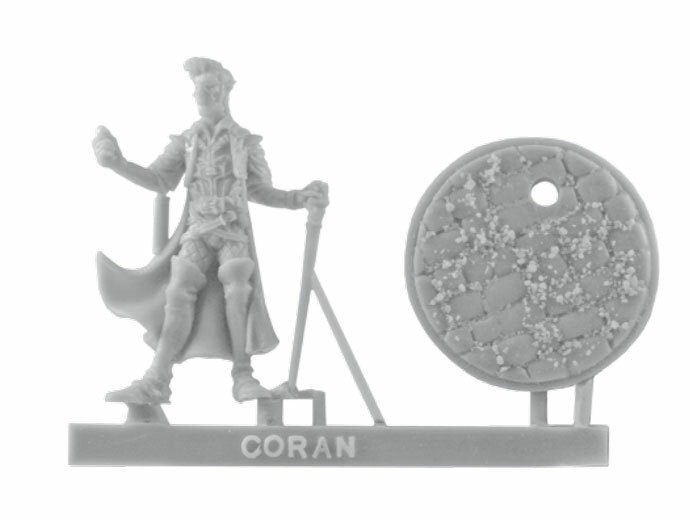 He knows not what that role will be, only what his father tells him in dreams: do not fail. 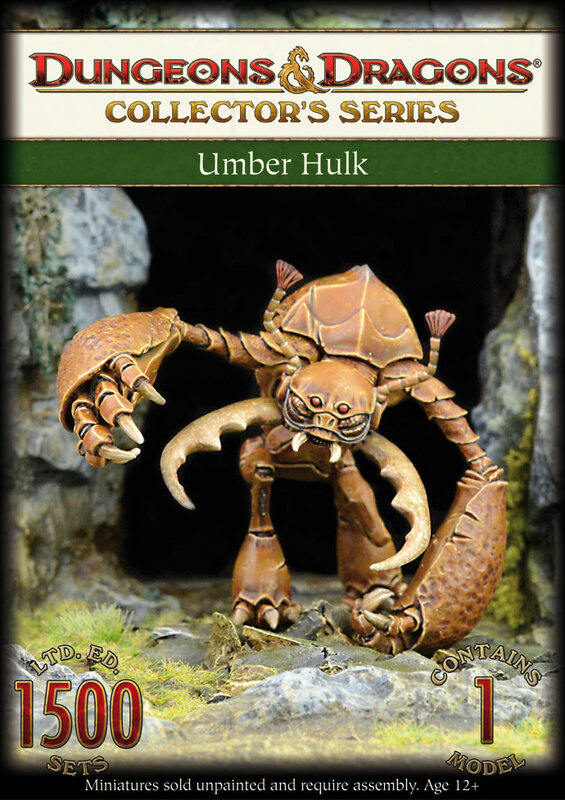 Umber hulks stand about 8 feet tall and possess large mandibles and huge claws capable of burrowing through solid stone. 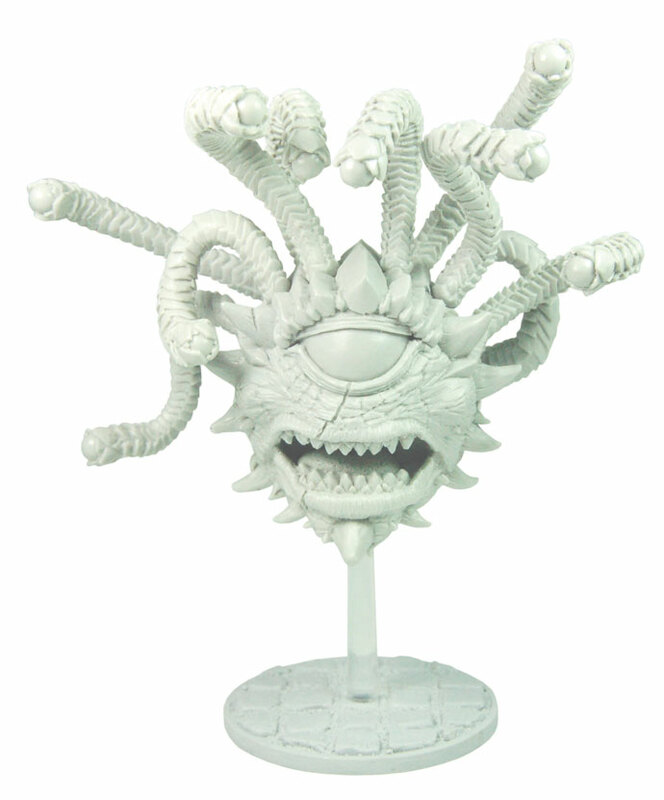 They have four eyes. 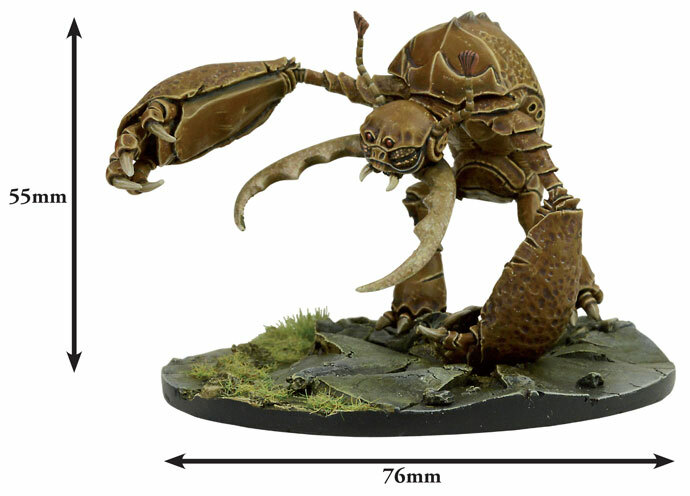 The two smaller eyes provide normal vision while the two lager ones enable the creature to see in the dark. 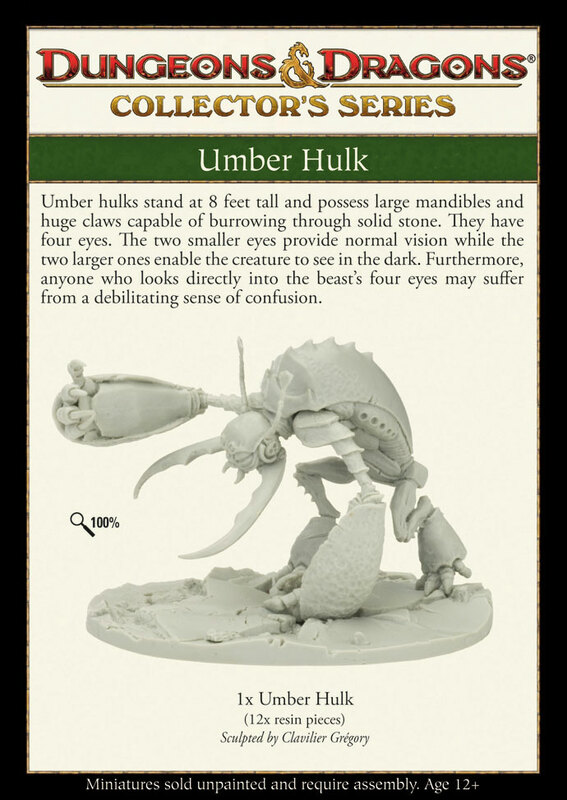 Furthermore, anyone who looks directly into the beasts four eyes may suffer from a debilitating sense of confusion. 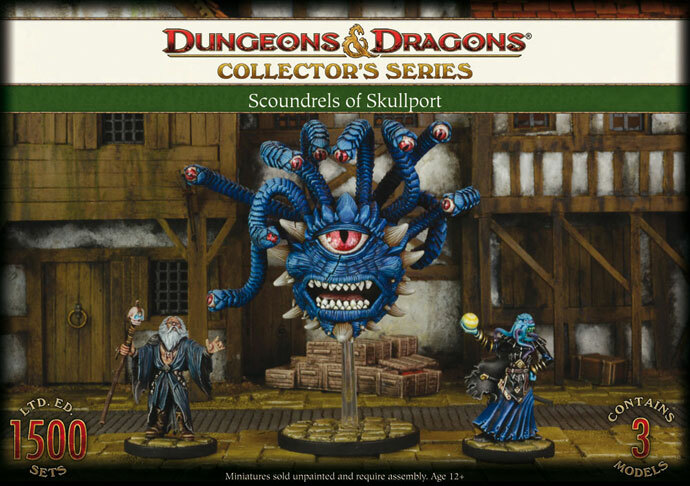 Skullport (Also known as the Port of Shadows) is nestled in the heart of Undermountain, deep below the streets of waterdeep, Powerful lords contend for control of this region. 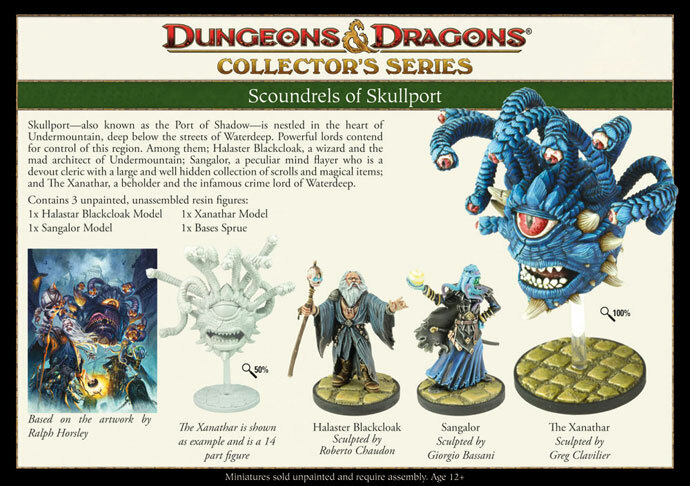 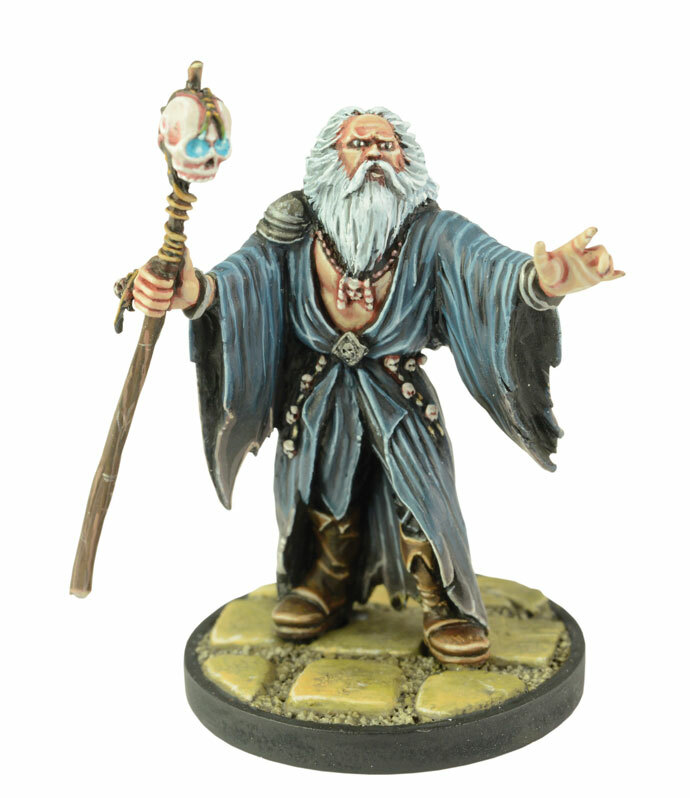 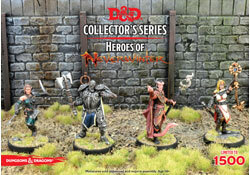 Among them; Halaster Blackcloak, a wizard and the mad architect of Undermountain; Sangalor, a peculiar mind flayer who is a devout cleric with a large and well hidden collection of scrolls and magical items; and The Xanathar, a beholder and the infamous crime lord of waterdeep. 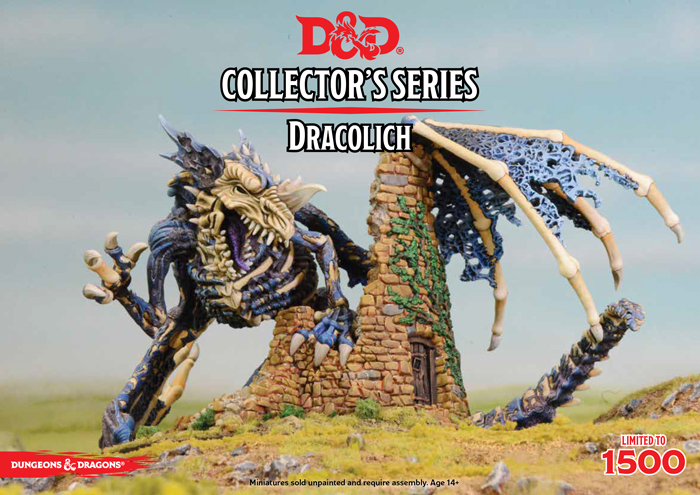 Somewhere under a lost and lonely hill of grim and foreboding aspect lies a labyrinthine crypt filled with terrible traps and ferocious monsters to slay the unwary. 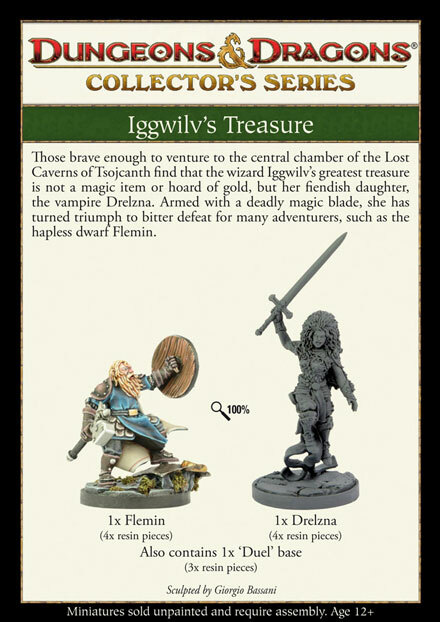 Rich treasures fill the dungeon, but some say that demi-litch Acererak, still wards his final haunt. 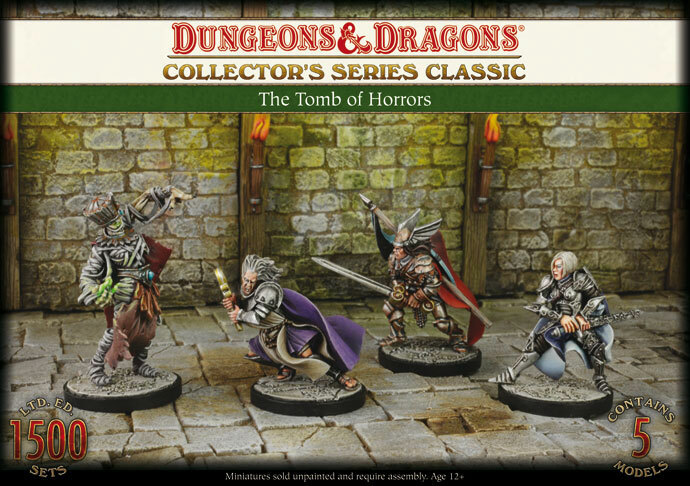 Only large and well-prepared parties of the bravest and strongest should even consider an expedition into the Tomb of Horrors! 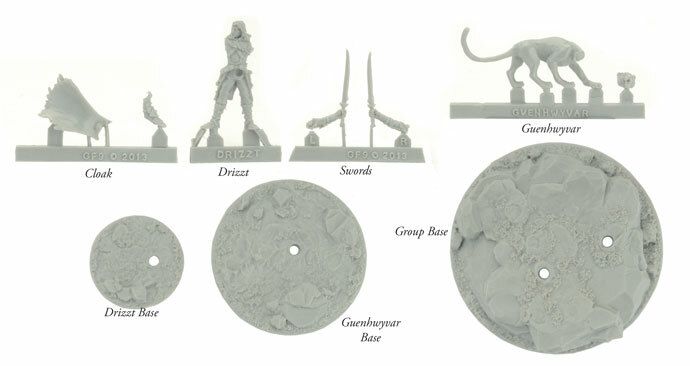 1x Paladin Frame; 2x Fighter Frame; 2x Mummy Frame; 1x Cleric Frame; 1x Acererak Frame. 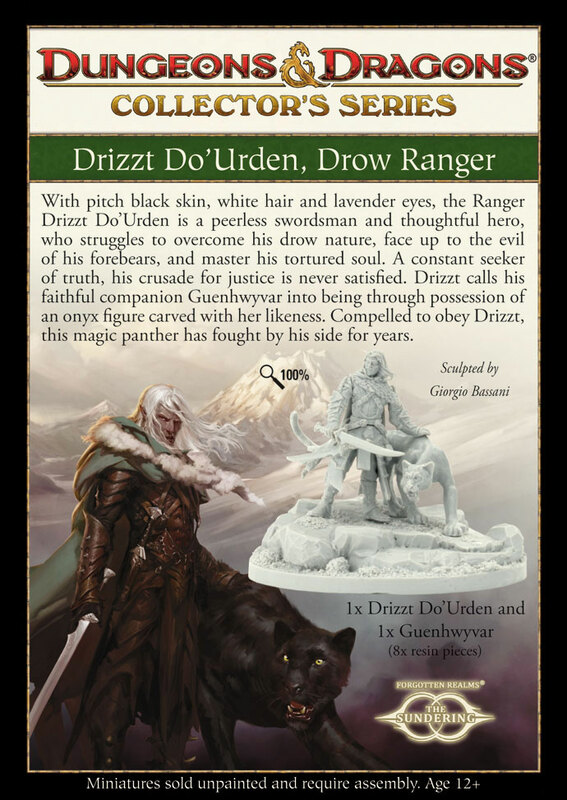 With pitch black skin, white hair and lavender eyes, the Ranger Drizzt Do’Urden is a peerless swordsman and thoughtful hero, who struggles to overcome his drow nature, face up to the evil of his forbears, and master his tortured soul. 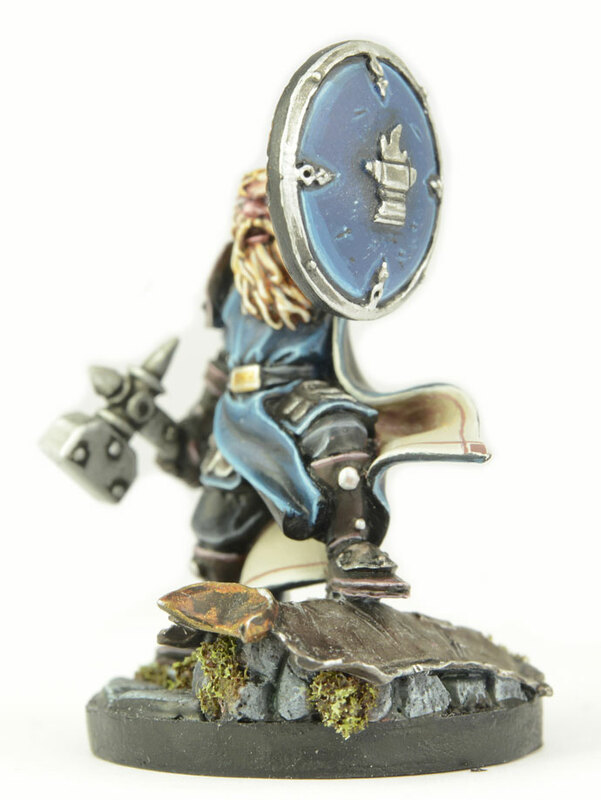 A constant seeker of truth, his crusade for justice is never satisfied. 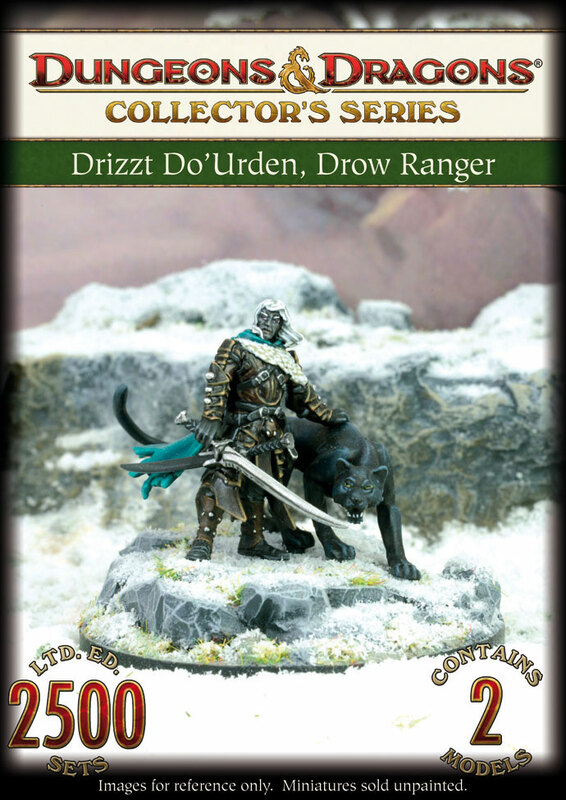 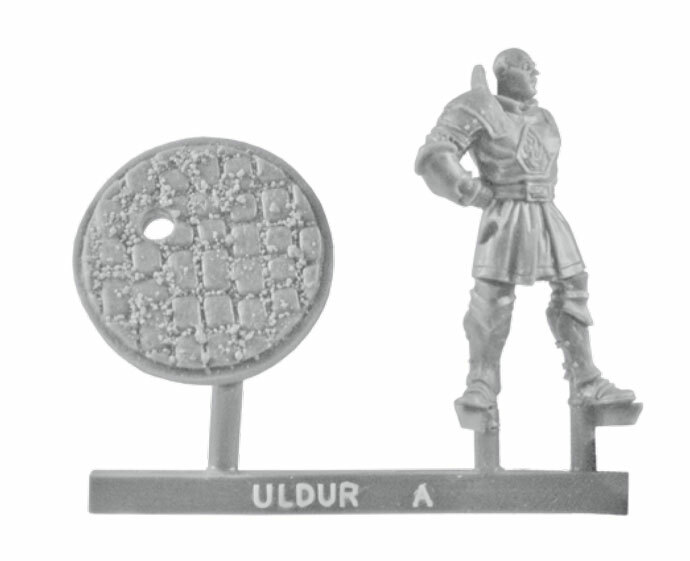 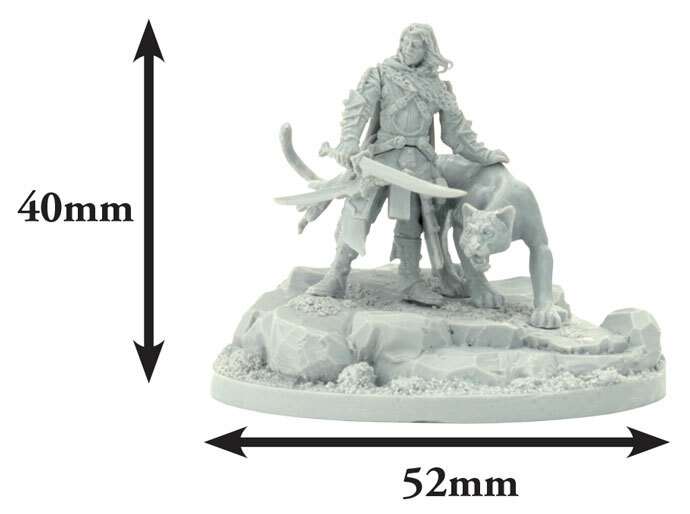 Drizzt calls his faithful companion Guenhwyvar into being through the possession of an onyx figure carved with her likeness. 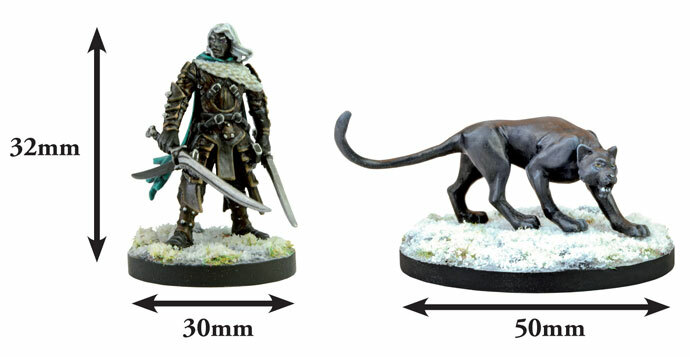 Compelled to obey Drizzt, this magic panther has fought by his side for years. 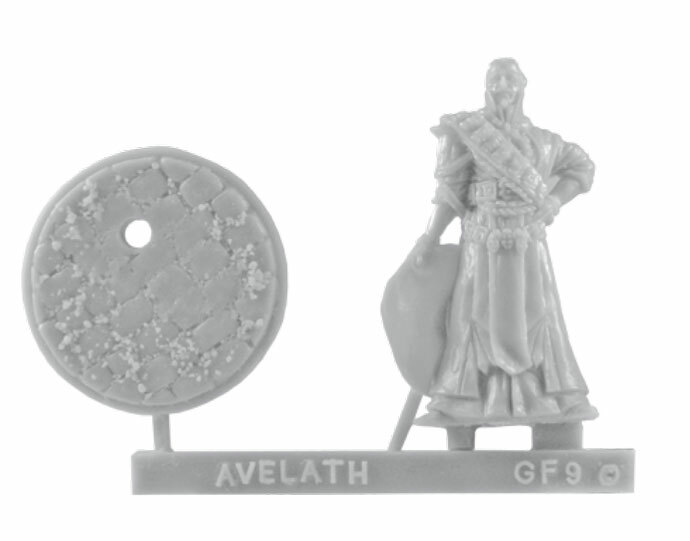 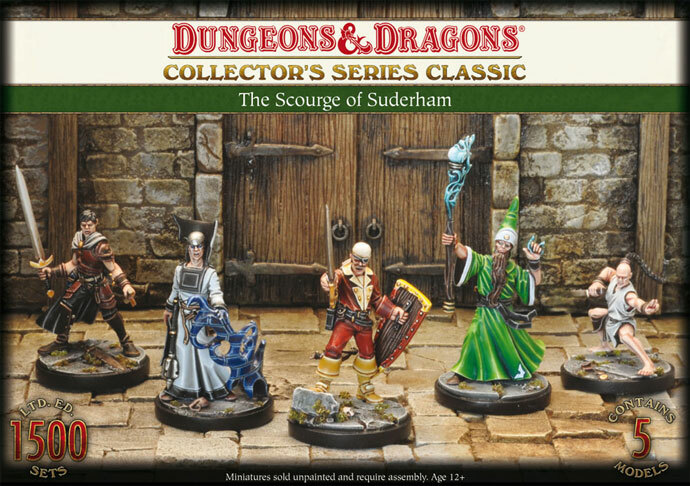 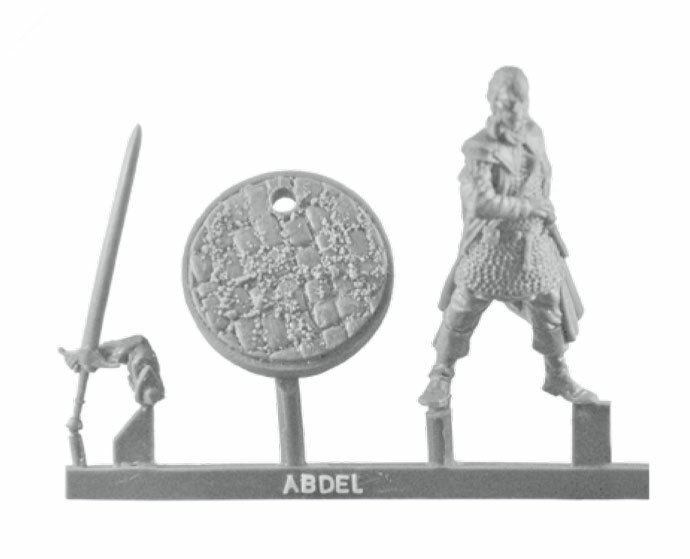 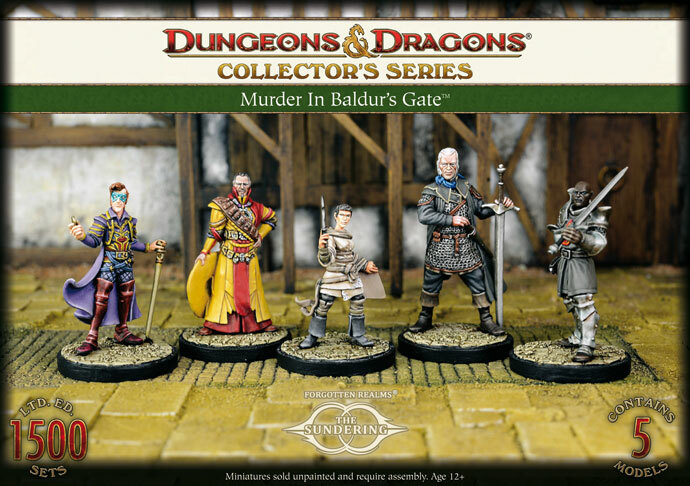 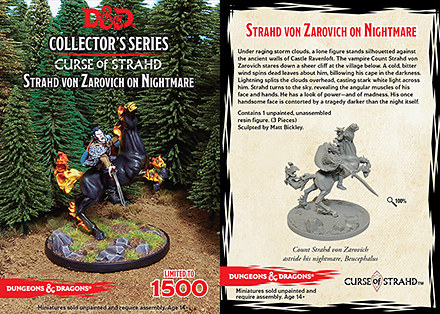 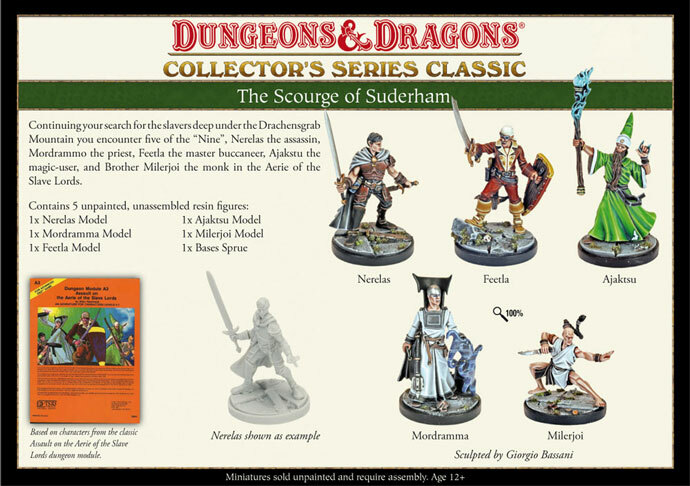 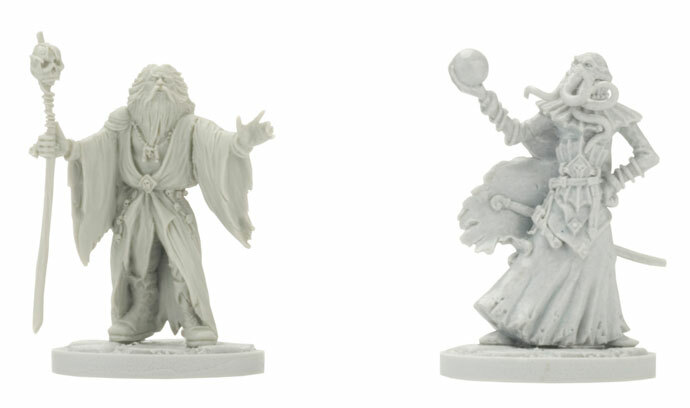 Continuing your search for the slavers deep under the Drachensgrab Mountain you encounter five of the "Nine", Nerelas the assassin, Mordrammo the priest, Feetla the master buccaneer, Ajakstu the magic-user and Brother Milerjoi the monk in the Aerie of the Slave Lords. 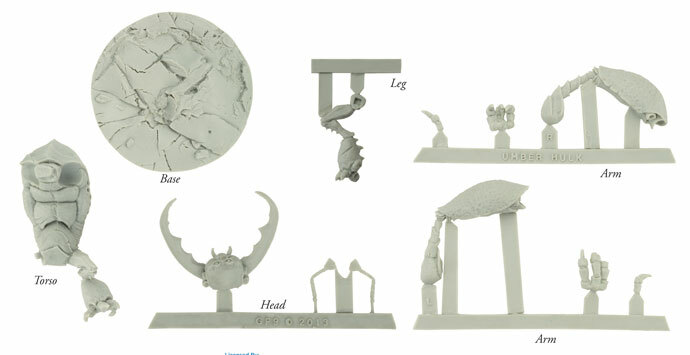 1x Slave Lord Nerelas Frame; 1x Slave Lord Feetla Frame; 1x Slave Lord Ajaktsu Frame; 1x Slave Lord Mordramma Frame; 1x Slave Lord Milerjoi Frame; 1x Bases Frame, 1x Base frame. 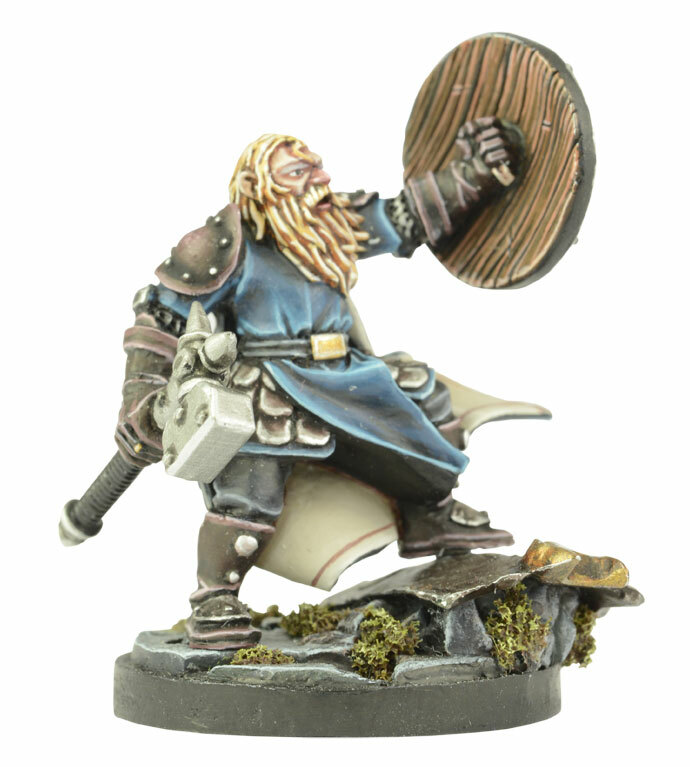 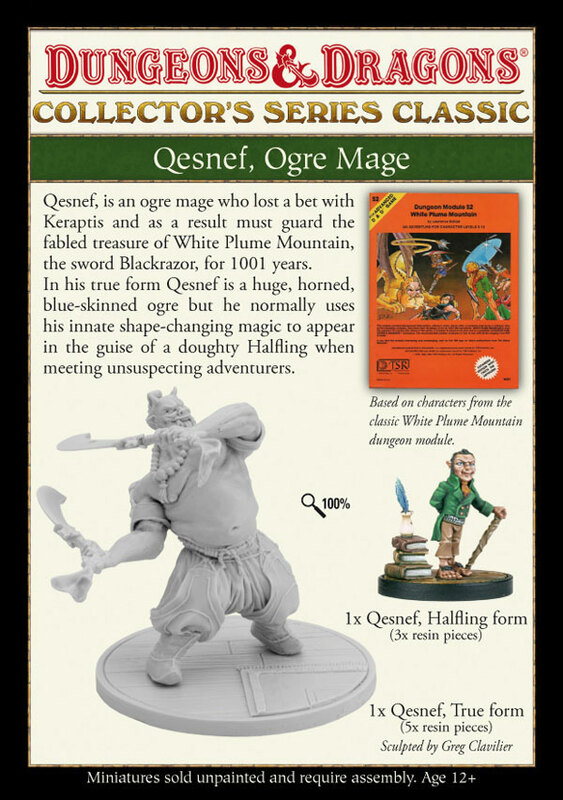 Qesnef, is an ogre mage who lost a bet with Keraptis and as a result must guard the fabled treasure of White Plume Mountain, the sword of Blackrazor, for 1001 years. 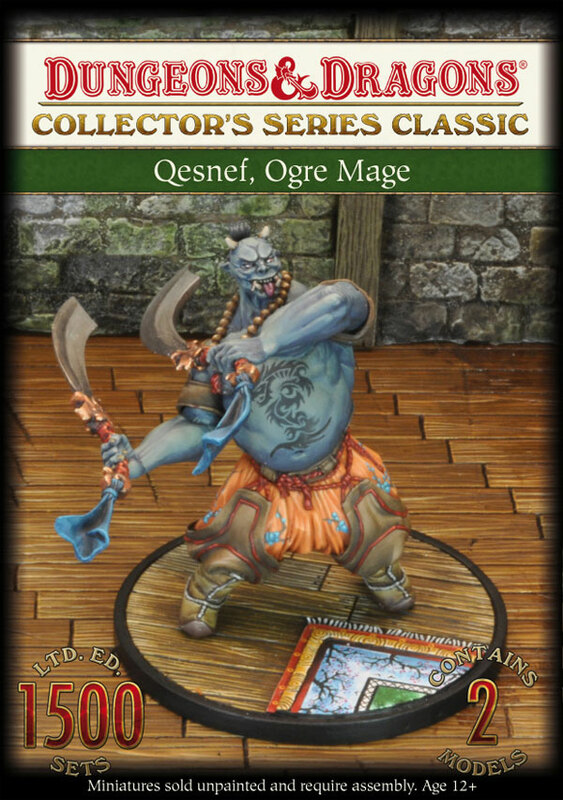 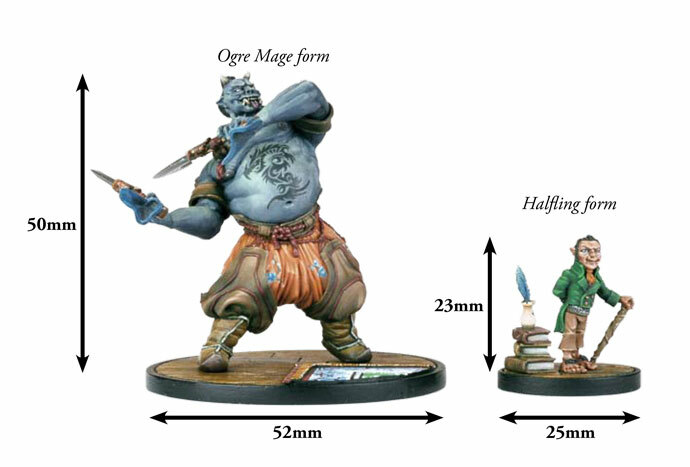 In his true form Qesnef is a huge, horned, blue-skinned ogre but he normally uses his innate shape-changing magic to appear in the guise of a doughty Halfling when meeting unsuspecting adventurers. 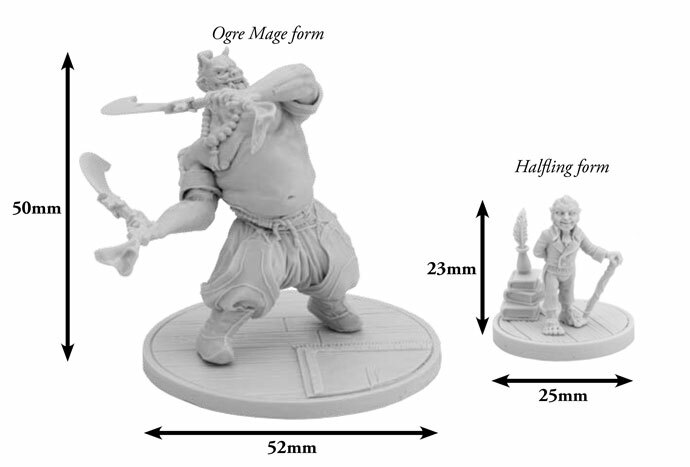 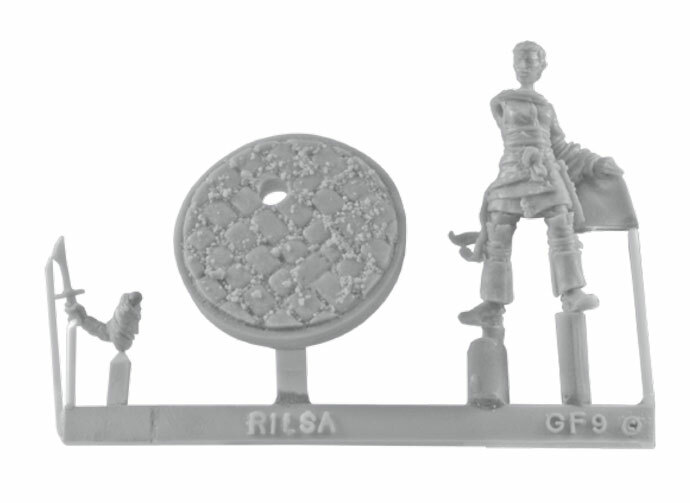 1x Halfling Frame; 1x Ogre Mage Frame; 1x Body; 1 Bases. 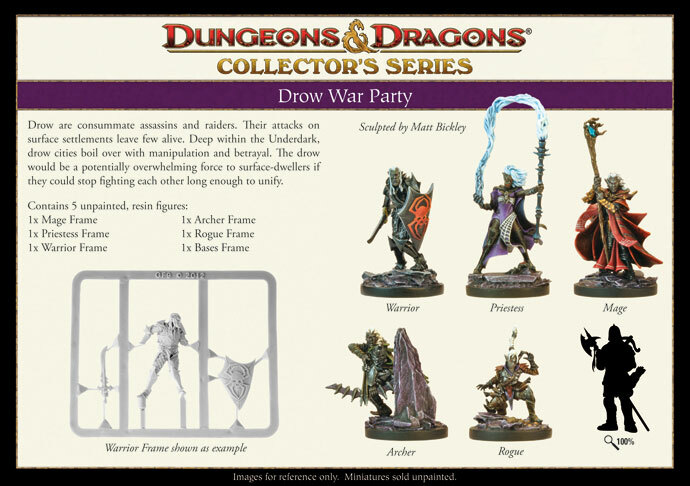 Drow are consummate assassins and raiders. 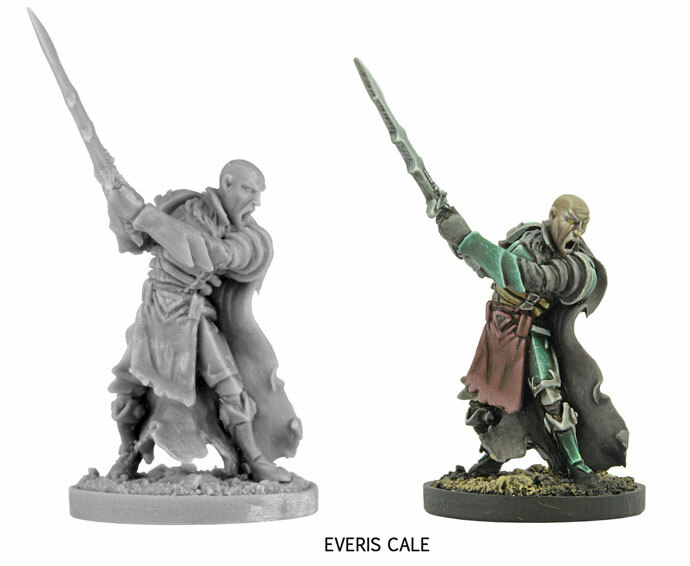 Their attacks on surface settlements leave few alive. 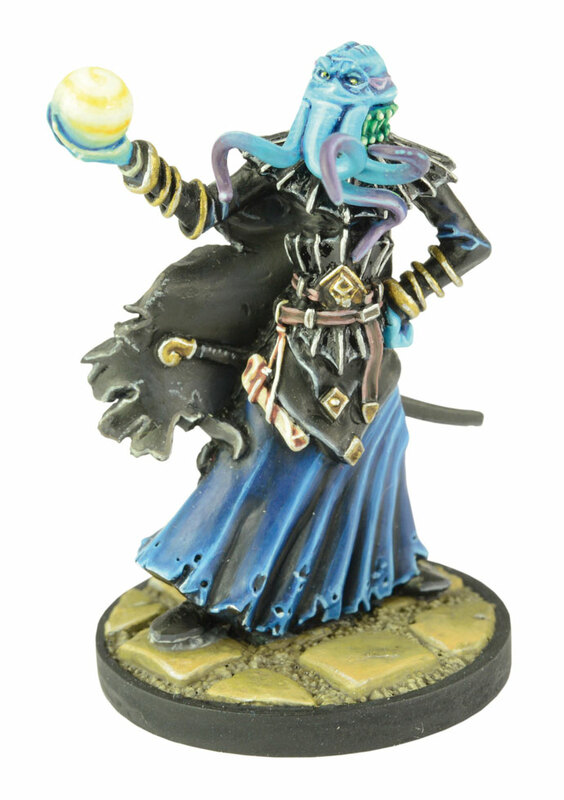 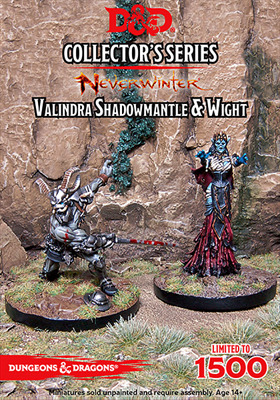 Deep within the Underdark, drow cities boil over with manipulation and betrayal. 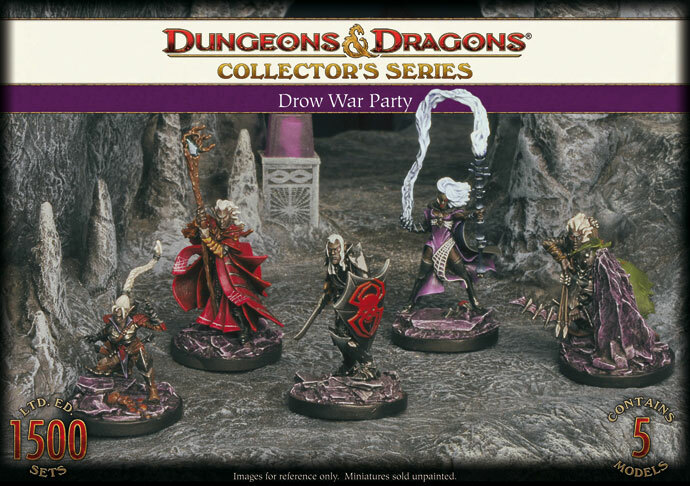 The drow would be a potentially overwhelming force to surface-dwellers if they could stop fighting each other long enough to unify. 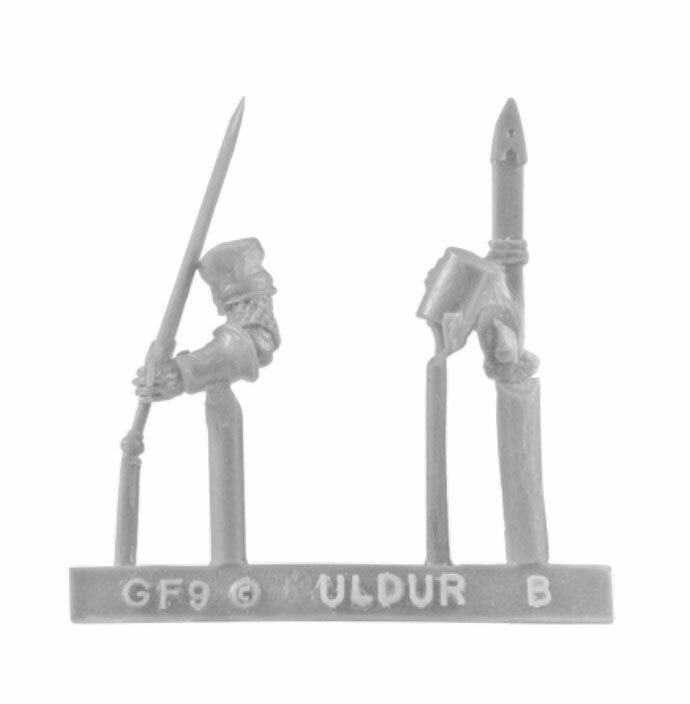 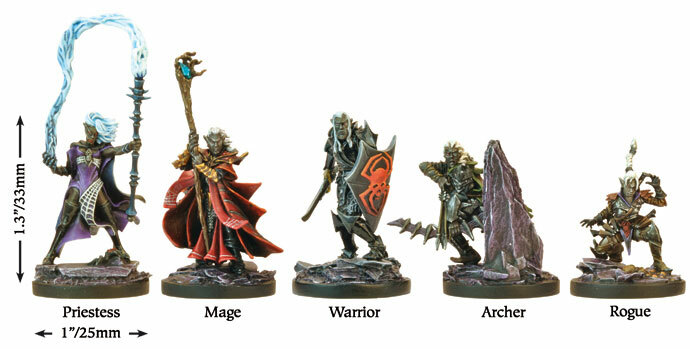 1x Illithid Warrior Frame; 1x Illithid Mage Frame; 1x Duergar Warrior Frame; 1x Gnoll Warrior Frame; 1x Intellect Devourer Frame; 1x Bases Frame.